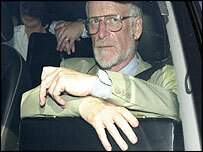 For many the sudden death of the government scientist and weapons inspector, Dr David Kelly, remains suspicious. The official verdict was suicide. But a public inquest was never completed. The Conspiracy Files explores the questions that still surround Dr Kelly's death in July 2003, when the controversy about Iraq's weapons of mass destruction was at its height. Doctors, lawyers, bloggers and politicians, question the official account; and the programme investigates what really happened when David Kelly walked up Harrowdown Hill.